Rudraksh Bracelets - Combination of rudraksha beads with small five mukhi rudraksha, Parad beads, Crystal beads, Lotus seeds to make an auspicious combination to strengthen your aura. A tool to create positivity around your with the help of rudraksha, crystal and Parad. 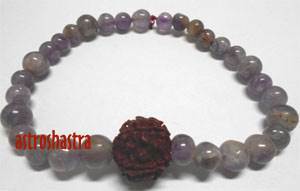 Astroshastra has combined the power of amazing Parad, crystal and Rudraksha beads in the form of Bracelets for negating bad energies and protecting you from evils. You can order for custom made Bracelets with the beads you wish to have. You can provide us with birth details of the person , who has to wear them and we would send the bracelet energized in his/her name. 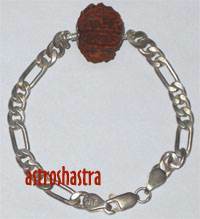 Explore the wide variety of exclusive and highly energized Rudraksha Bracelet available online , shipped worldwide at Astroshastra. Astroshastra is committed to provide world with rare source of energy with purity and certificate of authenticity. Our products are not only genuine but are sent after being energize by rituals mentioned in ancient vedic literature.